Our decision to complete one room at a time works fairly well. Although, we changed the flow plan somewhat. Initially we planned to start with the laundry, which we did. And we completed it. The first room finished. Victory! From there we went on to the master closet. Because! 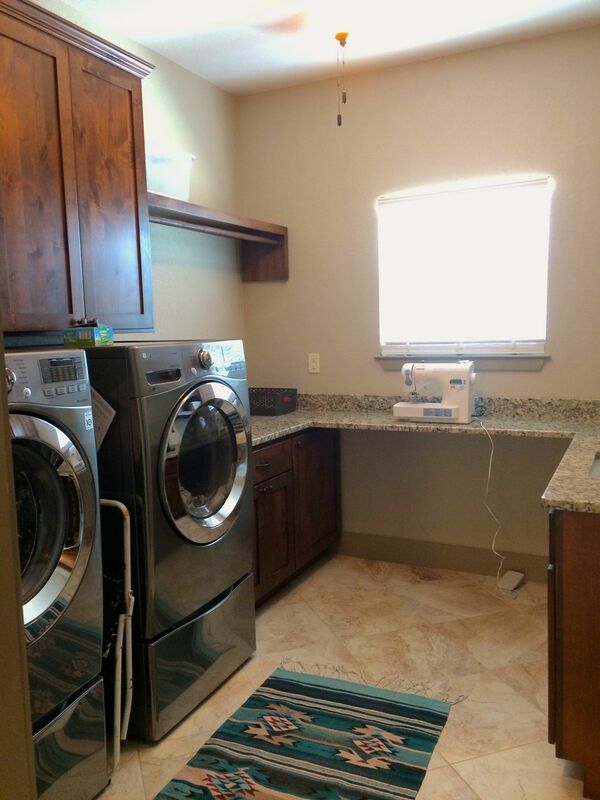 We designed the floor plan to have a door from the laundry room to the master closet. 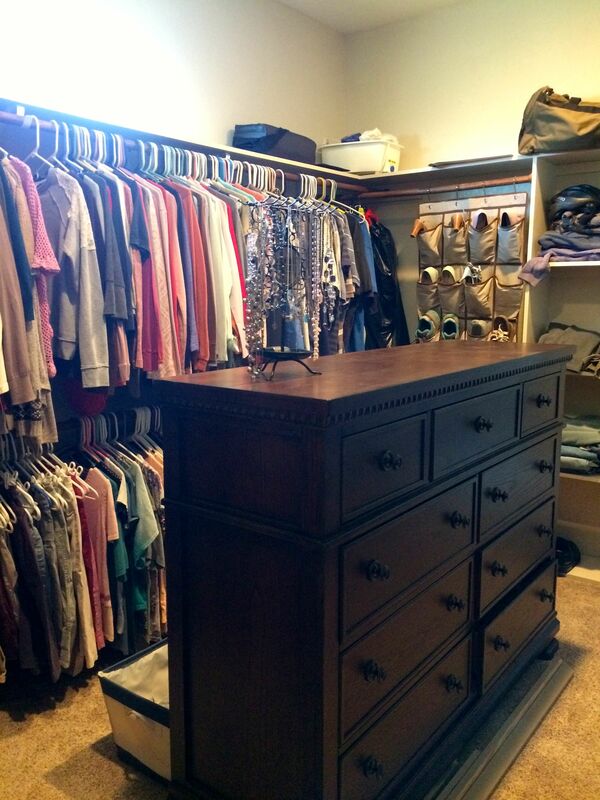 We also designed the master closet to have space for both of our dressers (mine is in the picture, Jon’s is off picture, to the right). All of our clothes in one place. Another fabulous idea. Jon and his dad installed wrap around clothes rods and a shelf and created two cubbies for storage. They measured, designed, and installed. I primed and painted, caulked and painted. I also did the final clean up and a lot of unpacking. Of course, we had to have a bit of a hiccup. As I worked my way around the baseboards, finishing the touch up paint, I came to one of the corners and discovered WET CARPET. Never, ever a good thing. We pulled back the carpet and pad and found damp cement. Unfortunately, Jon was sure he had somehow punctured one of the water lines to our master shower (located on the other side of the closet). The leak had not been there long and it seemed pretty coincidental that it started about the time he and dad were working on the closet. After a bit of exploratory surgery (Jon cut holes in our walls) and using an awesome device dad had (a tiny camera on the end of a “snake” with an attached video screen that let Jon see inside our walls), Jon discovered that he did not, in fact, puncture a water line. The leak came from an ill-fitting shower head. Our plumbers sent over one of their guys the very next day. He fixed the leak and checked the other bathroom shower and fixed a potential leak there as well. As soon as we patched and repainted the holes, we resumed our progress. The closet took up a good part of the shelving pile we have stacked in the garage. Which led us to our decision to deviate slightly from the plan: to start with the laundry and work our way down the east side of the house, then move on to the great room and kitchen, then finish up with the west side of the house. We decided we wanted to continue to whittle down the pile of shelving. Which room would use up more of the shelving? Jon and his dad have measured and cut everything. I have painted half of the shelves and plan to finish the other half this week, then finish painting the baseboards and doorframe. I look forward to a finished pantry. We’ve been cooking (and entertaining) in our house already, but I haven’t made a full shopping trip to restock our pantry, since we didn’t have one. Once the last shelf is in place, off to HEB I will go. In the midst of everything else we’ve been doing, we also emptied our final storage unit.Another victory! 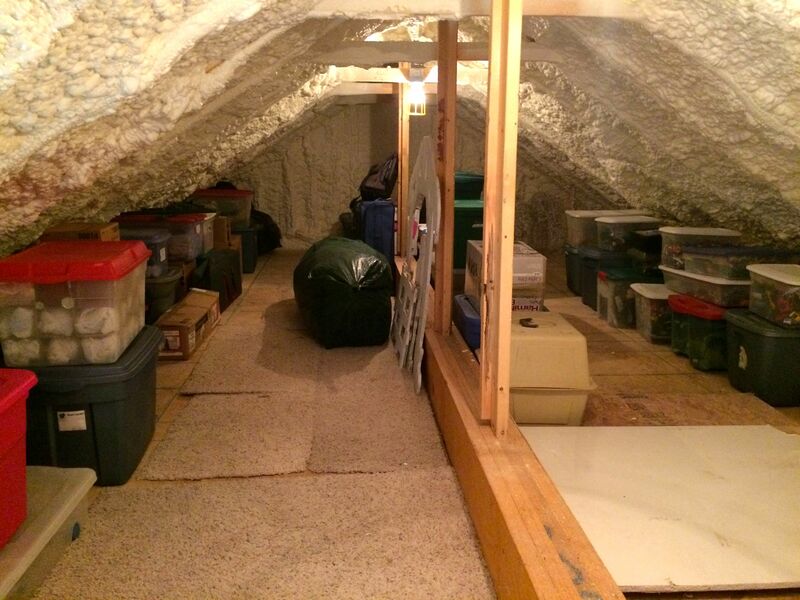 A couple of the trips were easy unloads: everything went straight to the attic. We have plenty of space for everything, with room to spare. Another design feature we love: we had stairs installed in the garage for access to the attic. It took up some extra space but I did not want one of those rickety ladders (been there, done that) in our retirement home. We still have some boxes in the garage, but most of them have been unpacked and absorbed into our house. I’ve been slowly finding places for everything and eventually we’ll start hanging pictures. Now that we have our furniture and a kitchen producing food, Wickie has settled down into his new home. 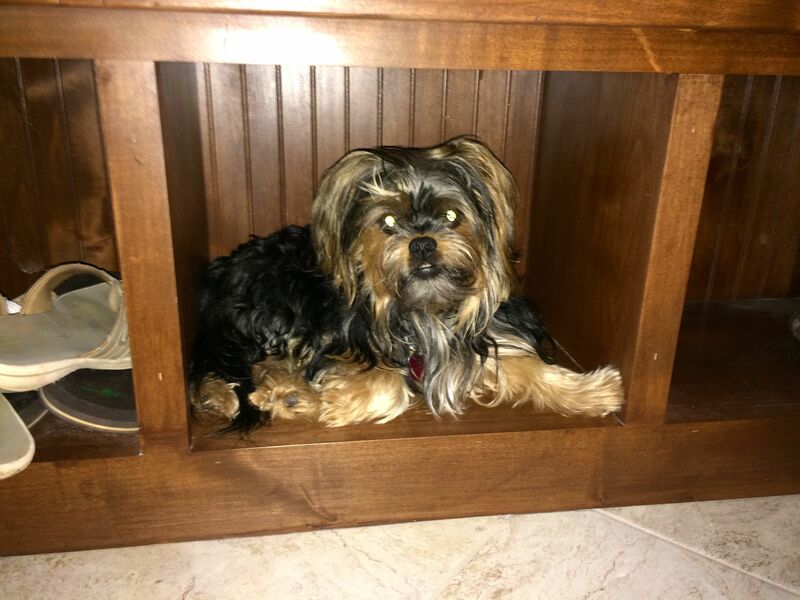 He has also found some new favorite places, like one of the cubbies in our mudroom bench. This entry was posted in Hill Country Living and tagged Country Living, River Chase, Texas Hilll Country, UBuild It. Bookmark the permalink.